I recently had about 50 folks over for a party. Upon entering my home, the first thing they saw is the large screening room. Most of my guests had never seen a video projector in a home theater setting before. I had one of the new Optoma HD80 1080p video projectors and a 120" Stewart Grayhawk screen set up, with an HD DVD demo loop playing. Most of my visitors were genuinely startled at the spectacular clarity and detail in the picture. When I told them the projector was only $2,700, several wanted to run out the next day and buy a similar rig. There is no substitute for seeing magnificent 1080p images live on a ten-foot diagonal screen. It drives home the point that TVs and flat panels don't quite get the job done when it comes to the "big screen" experience. High quality video projectors are the way to go. If you are not already familiar with video projectors, a demo like this understandably prompts a lot of basic questions: How do you get it to play movies? Can it be a TV projector also? Or a computer data projector? The answer is YES! Today's digital projectors can display video, movies, video games, satellite and cable TV, computer presentations, the Internet, or whatever. All you need is a signal source for the picture. That source can be a computer, a DVD player, a VCR, a digital camera, or your television set top box. As far as the picture is concerned, video projectors are just like digital televisions, with the exception that they project the image onto a separate screen rather than painting it internally onto their own self-contained screen. Well, okay. It isn't quite that simple. Another big difference between video projectors and televisions is that the projector typically has no audio on-board. There are some exceptions of course, where you have the projector, a DVD player, and speakers all in one bundle designed to sit on your coffee table. But projector makers generally assume that if you want a really big picture, you want really big sound to go with it. And you want the sound to come from the front of the room where the screen is, not from the back of the room where the projector is. That means routing the audio track into a much more robust audio system like your stereo, or ultimately a surround-sound speaker system. Today's digital projectors are built for either home video or commercial data use, but any given model is not normally designed for both. Those built for video use are generally not as bright, because you don't want an abundance of light in a dark "movie theater" environment. Video projectors are very high in contrast, because film and video images look their best with maximum contrast, deep blacks, and rich color saturation. Video projectors also have very quiet fans. You don't want a lot of fan noise in your home theater viewing room, so manufacturers have made great strides in making them as quiet as possible. Part of making them quiet is making them larger so the casework and internal cooling system can be baffled. Accordingly, you don't find too many small video projectors. Though there are dozens of projectors now being made that weigh less than five pounds, almost none of them are designed with home theater use in mind. 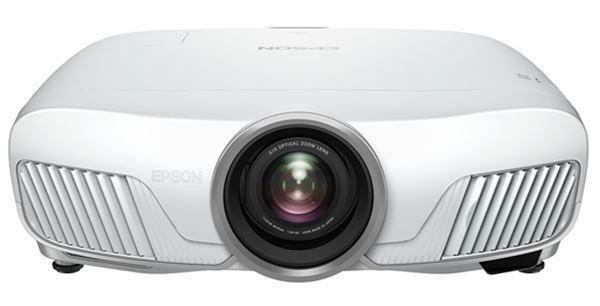 Video projectors also tend to have higher quality video processing chips on board than do data projectors. Higher quality processing means cleaner deinterlacing and scaling, for a smoother, more life-like picture. Projectors made for movies, TV, and home entertainment also have HDMI ports, or DVI ports configured with HDCP, which provides for the high resolution display of content restricted HD materials. These features are costly extras that manufacturers normally don't include on portable data projectors because they are simply not needed in the business presentation environment. Data projectors tend to be brighter and lower in contrast, because that's what works best in conference rooms and classrooms where there is some ambient light in the room and often a larger audience. Brighter light engines are built into compact form factors, so you can carry a lot of light power with you on the road in small, lightweight packages. Fan noise tends to be somewhat higher on portable data projectors because they are packing a lot of light into a little box. But that is okay, because it is much easier to live with some fan noise in a conference room than it is in a home theater, as long as it is not overbearing. Almost all data projectors have at least one audio speaker on board, and many have two. This enables you to give audio/video presentations from your laptop with adequate audio capability built in. Along with the speakers comes the audio jacks on the connection panel—something you don't find on many video projectors. Finally, the smaller data projectors built primarily for mobile presentation normally do not have high performance HDMI ports and component video ports, since small size is the primary objective. They do, however, take video signals through the conventional composite and S-video jacks, and quite often the VGA port will take a component video signal with the use of a component to VGA adapter. There are hundreds of different models of digital projectors currently in production. They each have an array of features designed for a specific use. Video projectors are a special breed of digital projector. They offer features and performance abilities designed to produce maximum video quality and to deliver an exciting home theater experience. Today's video projectors are amazingly inexpensive, genuinely outstanding in picture quality, and not too much harder to install than a toaster. Next time it occurs to you that your TV is just not quite big enough, think about stepping up to the very large screen experience that can be yours with the revolutionary new high performance video projectors on the market today. For more information, see our Home Theater Video Projectors Buyer's Guide and our Business Data Projectors Buyer's Guide.